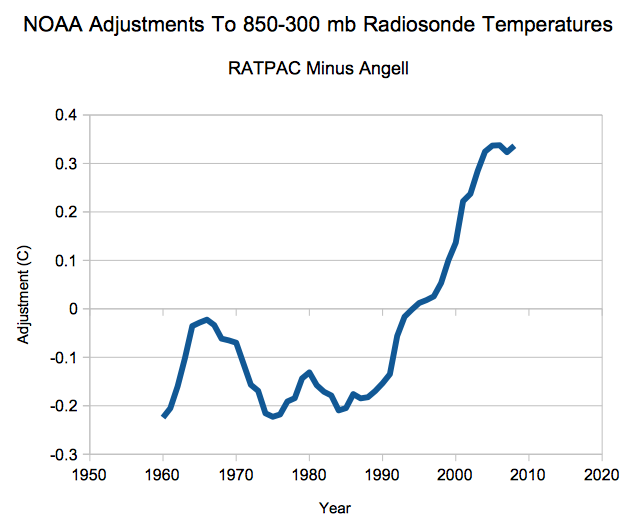 NOAA 850-300 mb radiosonde data shows about 0.2C net troposphere warming from 1958 to 2010, but after NOAA gets done tampering the net warming is about 0.8C. They accomplish this by a spectacular hockey stick of data tampering. What the hell? This is becoming Orwellian in the extreme. It’s what happens when you set out to find something you were told in no uncertain terms must be there. I used to be surprised what turns up when the right incentives are applied. Imagine you get to play with balloons and radios every day but your boss keeps reminding you his bosses think your data is not right and asks you to please look into it. 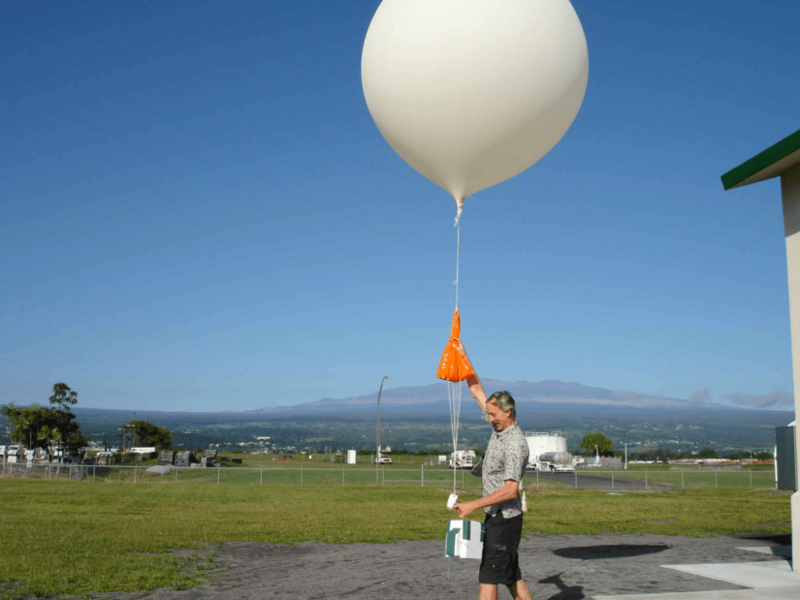 How many different radiosonde data sets are there? Five or six? NOAA can’t get control of all of them can they? ristvan, do you have any details on A, comparing the different data sets, and B, what and how many balloons were launched when for which data sets? If the measurements don’t agree with the hypothesis, then adjust the measurements until they do. This seems to be the new version of “science”. Gavin at it again, data infilling over large swaths of Land, and Ship Buckets..
Steven Goddard (whose real name is Tony Heller https://en.wikipedia.org/wiki/Steven_Goddard ) runs the realclimatescience dot com website. Goddard (Heller) is another typical Global Warming Denier in that he uses deceit/fraud to promote the denier agenda. The article included a fabricated graph that allegedly implied that Radiosonde (Weather Balloon) data showed no warming as compared to 58 years ago. The picture above shows how Steven Goddard (real name Tony Heller) combined two different graphs that measure two different observation data sets to get a single graph. In particular, note the words “I combined the two graphs”. There are several examples of outright fraud in Steven Goddard’s (real name Tony Heller) presentation. 1) The real complete radiosonde data set is available at http://www1.ncdc.noaa.gov/pub/data/ratpac/ratpac-a/RATPAC-A-annual-levels.txt . Why would anyone “combine the two graphs” when the real single-source data set is available? Graphs for the real data were shown earlier on this web page, and they show accelerating warming for the entire period of record. 2) The left side of the graph that Steven Goddard (real name Tony Heller) fabricated contains temperature data up to the 100 mb level in the stratosphere. As shown earlier on this web page, the 100 mb level in the stratosphere is cooling as per global warming models. 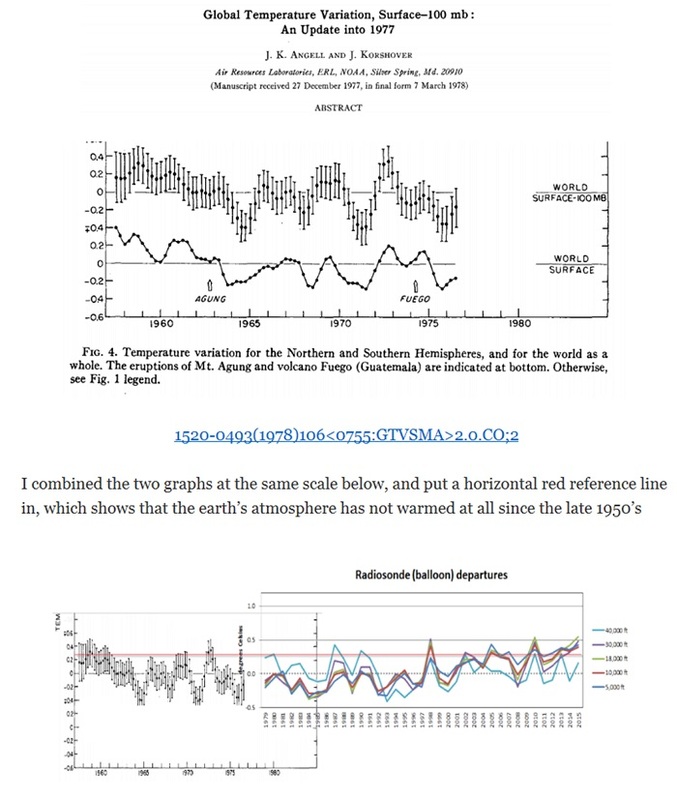 Steven Goddard’s fabricated chart combines stratospheric cooling (left side of Goddard’s graph) with tropospheric warming (right side of Goddard’s graph), and then he alleges “NOAA Radiosonde Data Shows No Warming For 58 Years”. 3) The original chart that Steven Goddard (real name Tony Heller) used was published in the Journal of the American Meteorological Society, and was used to show short term variations in global temperatures. This included normal brief cooling that follows volcanic eruptions. Steven Goddard erased the labels for the Mt. Agung and Fuego eruptions from his combined chart. Did this moron even bother to read the post he is commenting on? Doesn’t make any difference. I wanted (and succeeded) in getting you to read my post. Q: We might ask: What happens to someone who ends up being a financial failure and wants to blame “The Conspiracy” for all of his problems? 1. not satisfied or content with currently prevailing conditions or circumstances. 2. dissatisfied with the existing government, administration, system, etc. 3. a malcontent person, especially one who is chronically discontented or dissatisfied..
Dear me, what an incredibly vitriolic, pig-ignorant post. You utterly lack the scientific literacy to critique Steve’s post, so you launch a vicious, intensely personal attack. What a profoundly nasty little creep you are, Butler. SG, For the post you erased, I would be an immediate and absolute ban on this low-life piece of gutter trash. Bill the MORON links to Ratsac data which is shown to be massively adjusted. He must be an escapee from a mental asylum or something? The only FRAUD around here is from the AGW scammers. The Angell data clearly shows the balloon data from 1960s as being much the same temperature as now. Just like all other raw data does, before the climate scammers get their hands on it. Which trough do YOU swill from, Bill the Butler ???? Are you seriously trying to THREATEN someone, to SCARE them? You are a base level, disgusting CRETIN from the bottom of the deepest SEWER.. !!!! Andy, you are missing the point. I am awestruck how quickly Bill Butler uncovered Steven Goddard’s real name. It only took him a couple of weeks and he got him! Beware of Butler the Sleuth, he will find you out, too! Steven, aka Tony, now you are seeing Big Brother’s wrath! Steven, please count this attempt to silence you as confirmation of your success in getting information past the official gatekeepers of knowledge. I bet this slimebag is a Bernie Sanders supporter. The attempt to intimidate is right down that alley. roflmao.. Computer science… probably does some basic programming of pretty games, or climate models…..
…. while having basically zero knowledge of anything to do with the atmosphere. …. like, Social science, Political science etc etc..
…. just to pretend it has something to do with real science.